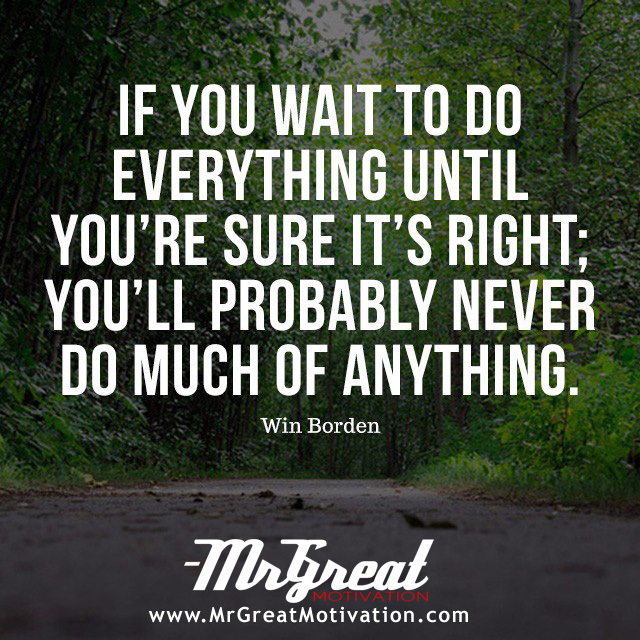 If you wait to do everything until you're sure it's right, you'll probably never do much of anything – Win Borden. Home Motivational Quotes If you wait to do everything until you're sure it's right, you'll probably never do much of anything – Win Borden. There are no guarantees in life. Even the so-called safeguard of having a home, a family and business capital will pass. The general threat that runs through all is that we want to make sure we’re doing it right. The answer is quite simple: you have to try, fail and try again. There are no guarantees that you will always be successful in your attempts. There is only the way. So you set goals and fail to achieve them? What should you do? First, you have to understand that failing to accomplish your goals does not mean that you have failed. It just means that something is wrong and you need to change your approaches. You need to change your approach. And you need to change the way you do things. Just like if there is no rain, you will never appreciate the sunshine. If there is no loss, you will never feel the pain. What is familiar is comfortable. Even though the familiar might be worse than the unfamiliar, we still tend to hold on to it, because going into the unknown is awkward. Having the guts to go into the unknown can be tough, but not impossible. It requires a shift in perspective. It requires right mindset and great motivation. The opportunity of living life is a very special, fleeting thing and the time we have to live our lives is relatively short. So don’t waste time until you’re sure it’s right. Keep right mindset and positive attitude to make things right. Stay blessed. Stay motivated. We hope guys you find Quote "If you wait to do everything until you're sure it's right, you'll probably never do much of anything – Win Borden." by Mr Great Motivations useful. If you think we have made some efforts, then don't forgot to appreciate us by sharing this Quote with your friends and family, And thanks for visiting.